K.C. I am envious of you seeing the SDL39's on that line! As for a schedule, Don what were you referring to as a mining season? I know the lakes freezing would limit the boats, but I thought that really only plagued the ports that depend on the Locks. As far as train frequency we waited about an hour I wanna say and this guy popped out of the woods. CAT345C wrote: As for a schedule, Don what were you referring to as a mining season? I know the lakes freezing would limit the boats, but I thought that really only plagued the ports that depend on the Locks. It is my understanding that mining operations shut down or at least significantly slow down from around December-January through March do to freezing weather. Yea it doesn't surprise me that they would shut down in the winter. A fella that a lot of us know in the railroad industry tells me that Port Inland Limestone is some of the best out there. So there is a positive note for this state. It took us a while to realize that G&W had gotten this operation. 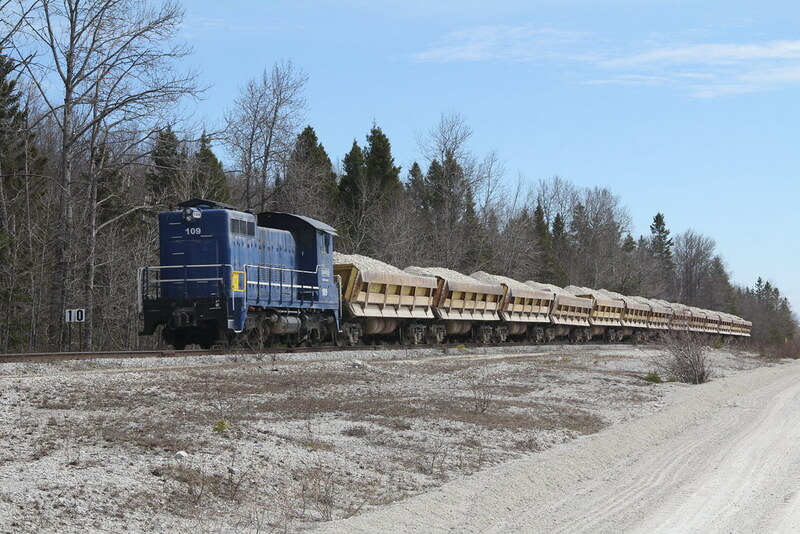 We saw a G&W RailLink truck in Manistique and put two and two together. A year or two back there was talk of a lime plant being built at Port Inland and shipping by rail. I've never heard anything more about this. Did it ever happen? Heres two interesting shots from Port Inland taken on July 27 2001. SDL-39 587 is unloading a cut of cars at the Port Inland dumphouse. Inside the dumphouse, a difco car is tilted and its load discharged. Here are some of my photos of the RR http://crow_t_robot.rrpicturearchives.n ... x?id=68779 I know the engines aren't CIM anymore just to lazy to correct them. Crow T Robot wrote: Here are some of my photos of the RR http://crow_t_robot.rrpicturearchives.n ... x?id=68779 I know the engines aren't CIM anymore just to lazy to correct them. Nice pics Crow. Wonder what the box car is doing on their line? I believe they get explosives in from CN in those box cars. I thought I had also seen covered hoppers there at one point but not too sure. I am new to this site, but I do have a bit of knowledge about the Port Inland Railroad. I have done contract work for both WC/CN, Michigan Limestone, and Western Lime. The operation in the Quarry was operated by WC before the buyout by CN. The RCO used locomotives and the converted Algoma Central cabooses. Power was usually one four axle. I do not recall what model number. IIRC, the mechanical super in Gladstone told me that what ever locomotive was in the yard and ready would be sent over when the quarry loco needed service or repair. When CN came on scene, they had no desire to run this operation. G&W was contracted to operate the system shortly thereafter. Having been on the property, with permission, I have had the opportunity to see some very interesting sights. For years, the electric locomotives equipped with a side dump body were stored on site. As far as I know, they reside there to this day along with the cars used to repair the old catenary. 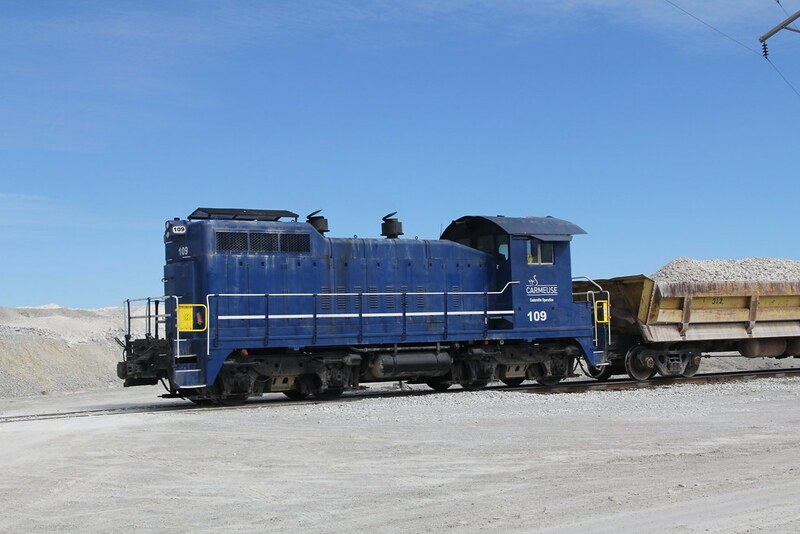 Michigan Limestone management told me that they had been working with the National Railroad Museum in Green Bay to donate some of the equipment but the project has languished. Western LIme did indeed build a new lime kiln on site. I believe the plant started up in 2003. The lime plant accounts for the covered hoppers. As for explosives in boxcars, I have no first hand knowledge but I would not think that likely. Last I knew explosives were trucked in from Ishpeming, MI. This is a very interesting operation. I would reiterate that you should not attempt to enter the property without the permission of the owner. Last edited by Standard Railfan on Sat Feb 11, 2012 11:08 am, edited 2 times in total. Standard Railfan wrote: I am new to this site, but I do have a bit of knowledge about the Port Inland Railroad. I have done contract work for both WC/CN, Michigan Limestone, and Western Lime. The operation in the Quarry was operated by WC before the buyout by CN. The RCO used locomotives and the converted Algoma Central cabooses. Power was usually one four axle I do not recall what model number. IIRC, the mechanical super in Gladstone told me that what ever locomotive was in the yard and ready would be sent over when the quarry loco needed service or repair. When CN came on seen, they had no desire to run this operation. G&W was contracted to operate the system shortly thereafter. Having been on the property, with permission, I have had the opportunity to see some very interesting site. For years, the electric locomotives equipped with a side dump body were stored on site. As far as I know, they reside there to this day along with the cars used to repair the old catenary. Western lime management told me that they had been working with the National Railroad Museum in Green Bay to donate some of the equipment but the project has languished. Good to know, I had only heard rumors that they received explosives by rail, it can often be a pain in the rear to ship explosives by truck, but then again what majorly populated areas are you traveling through from Ishpeming to Port Inland. We we stood at the crossing where we shot that train we could see some type of stored equipment way off in the distance if we zoomed in on a computer after using a 700 or 800mm lens that Pullano had. I thought they used it as a spacer?? Not sure whats inside the boxcar looked to me like an engine(maybe) or a large weight. My last series of picture not posted they were not using the boxcars in them. My guess is the box car is used to carry tools and such that might be needed when they are on the road. I know it is overkill for a few tools but its not unheard of. Is the Cedarville operation still running? I don't think I had heard of that before. Does anyone have an idea of how often the trains run or how late anymore to and from the docks? May be in that area soon and if time allowed a quick stop to catch a move wouldn't be the worst thing in the world. With one train currently running i would imagine they are running a lot, they have about a hour and a half round trip time at the public crossing from what i have been told. A lot of ships have loaded there the last couple weeks so that keeps them busy hauling rock. Current power it OPT 2030 a SD20, LSLX 1309 EMD GP9r and soon another OPT SD20 will be joining them. JANGAJONGA wrote: Is the Cedarville operation still running? I don't think I had heard of that before. Cedarville is still running. Pictures taken 4/29/16. Loco is remote control, nobody on board. Any public access to take pictures? Wow! I had no idea that line existed! I knew of the Port Inland, but I didn't know there was a short quarry line in that part of the UP.